Pokemon in Minecraft. No Mods! Cbattle revamp is in development! Soon you will be battling the best and striving to become the best trainer. 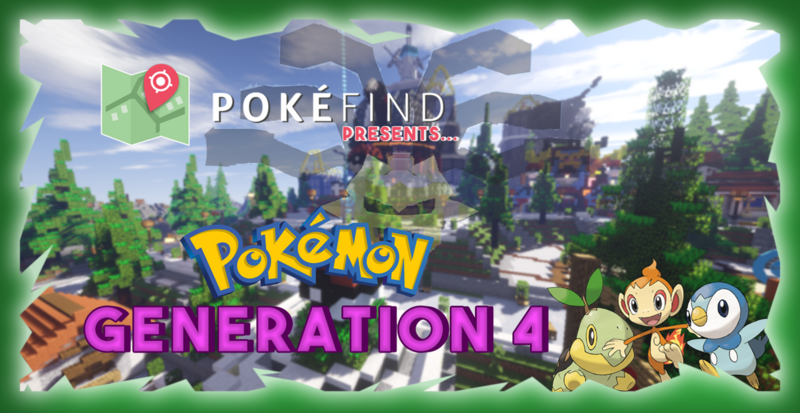 GENERATION 4 IS NOW OUT! The highly anticipated Generation 4 update has been added to Pokémon World! Pokémon Factions is now out. This unique gamemode transforms you into a Pokémon and go up against other factions. 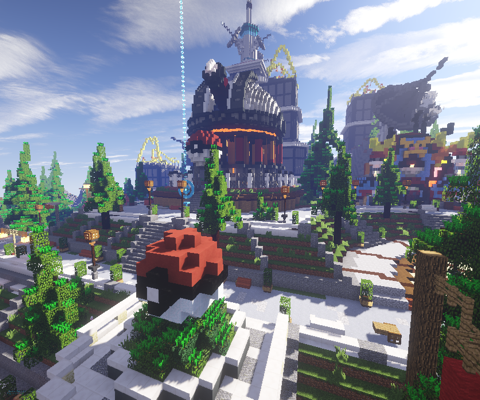 Season 3 has begun on Pokémon Skyblock adding new Pokémon and mechanics. We’ve had some more really great submissions since the last time we posted! We have chosen 3 outstanding submissions for this week. Don’t be discouraged if you did not get chosen this time because you can still win in upcoming showcases. Our first winner of this week is Iron_Purge! They submitted this Sylveon art with beacons in Minecraft! Our second winner is PlazmaVolt! They have drawn this very cool Mega Shiny Rayquaza! Our final submission for this week is from Luk_Aszek! They made this great fan trailer of PokeFind! We are sorry for this being posted later than normal. We’ve had some more really great submissions since the last time we posted! We have chosen 7 outstanding submissions for this week. Don’t be discouraged if you did not get chosen this time because you can still win in upcoming showcases. Our first submission chosen for this week is from Anouck1! They made another amazing pixel art, this time it’s Mewtwo! 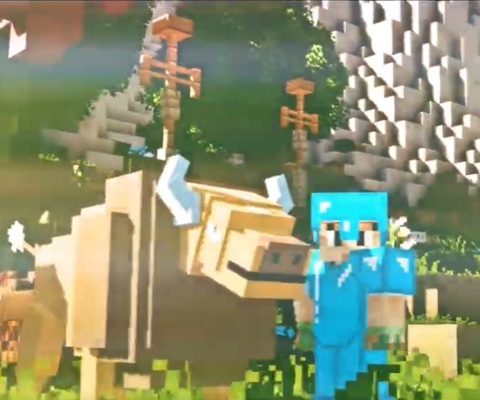 Our second submission of the week is from NyanTheWolf! They drew this incredible picture! Our last submission of this week is from Hushiee! She made this outstanding picture of Ash and Pikachu! Our next winner is SuperBabyMelody! They submitted this really cool picture of an Eevee they made, so cool! Our next submission is from zPancake! They made this really nice picture of a bunch of different Pokemon! Our next submission is from Wolfpaw_11! They drew a neat picture of a Vaporeon! Our last submission of this week is from Amolad (TrajsValentine)! They made these really creative drawings of Haru and Sora! I totally just swept one of my team members in competitive battling, My Arceus and Weedle are an absolute beast in Uber tier! That’s right, I said Uber tier - when you join any Pokemon World server you can /cbattle and queue up for Normal Tier or Uber Tier! Shadows are banned in both tiers! Both tiers restrict you to only one Pokemon of that same species and they both restrict multiple of the same held item. Uber Tier allows Anniversaries and Legendaries to be used. Normal Tier bans Anniversaries and Legendaries. I’ll tell you one thing though that I am extremely hyped about, we are introducing Season 1 Battle Pass!! The more you play, the more you get. Hop into Competitive Battle (/cbattle) to prove your skill and gain Battle Pass experience every time you faint an opponent’s Pokémon and win. What happens if I buy the Battle Pass late in the season? You will receive all the rewards up to the current level you are at at the time of purchasing. You won’t miss out! You can Edit your PC Background through the settings in your PC. New PC pages can be earned in Battle Pass. You are able to change these through the PokeWorld Cosmetics Menu in your /pokegear! New Summon Effects can be earned in Battle Pass. A new and improved Battle UI, we have redesigned the entire battle system. It feels more like an accual battle gui with custom buttons, a battle field and much more! The Battle Backgrounds can be customized to your liking as well! These can be changed and altered in your PokeWorld Cosmetics Menu as well! New Battle Backgrounds can be earned in Battle Pass. We’ve had some more really great submissions since last week! We have chosen 3 outstanding submissions for this week. Don’t be discouraged if you did not get chosen this time because you can still win in upcoming showcases. Our first submission of the week is from AlmightyPiLord! They have made this absolutely incredible art of Jolteon’s and part of their skin! Our second submission of the week is from OkamiDreans! They have made some great Pokemon concept ideas! Our third winner of this week is Sarasa77! They have made this insanely detailed picture of an Eevee! Magnificent and very well done! We have had a ton of new community submissions since our last post! We have chosen 4 amazing submissions for this week. Don’t be discouraged if you did not get chosen this time because you can still win in upcoming showcases. Our first chosen submission for this week is from TaichiOG! They have made this cool pixel art! Our second submission of the week is from PlazmaVolt! They submitted their Rayquaza drawing!! Our third submission comes from Ballmat! They have created some very cool Pokemon Model concepts! Our final submission of the week is from Anouck1! They have created this incredible Captain America Pixel Art! We’ve had quite a few community submissions since our last post. We have chosen 6 outstanding submissions for this week. Don’t be discouraged if you did not get chosen this time because you can still win in upcoming showcases. 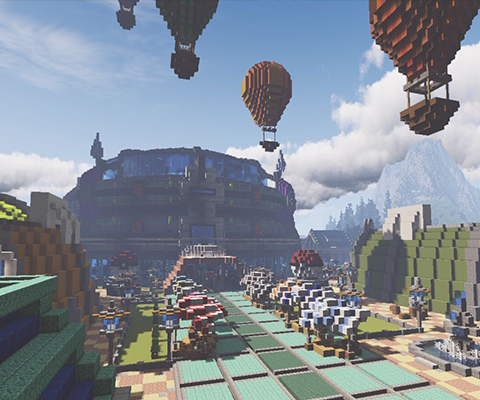 Our first winner of this weeks Community Showcase is RG_Minx! Showing off their cool pixel art on Skyblock. Our second submission of this week is DragonMaster_667! They are showing off their drawing of some Pokemon! Our next submission is from Cringe_2o19! They made some awesome PokeFind fan art! Our 4th submission of the week is from _Siamese_Cat_!! They submitted this incredible video they put together for Gen 4! 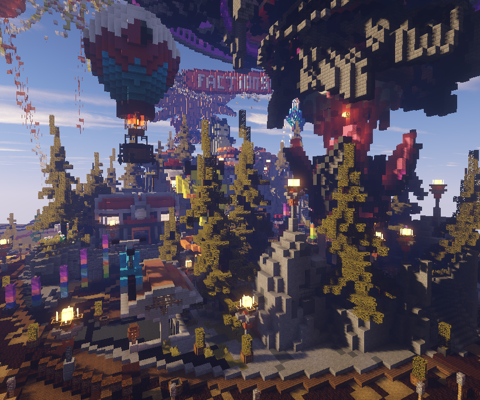 Our next community submission of the week is from FieryGhast! They designed this cool Anniversary Weedle concept! Inspired by some awesome pokemon. Our last submission of the week is from Wolfpaw_11! Their submission is some creative art of an Espeon and Umbreon together! We’ve had quite a few community submissions again showing off their incredible achievements and skills. We have chosen 4 outstanding submissions for this week. Don’t be discouraged if you did not get chosen this time because you can still win in upcoming showcases. Starting us off for week 2 of the Community Showcase is Marmar3! They have made this outstanding image! Our second submission that has been chosenis from zPancake! They put together this cool picture for PokeFind! Our last submission for week 2 is from Baeporeon! They have submitted some great artwork and creativity they have made along with great penmanship! We’ve had a lot of community submissions showing off their incredible achievements and skills. We have chosen 3 outstanding submissions for this week. Don’t be discouraged if you did not get chosen because you can still win in later weeks. Starting us off is sarasa77, showing off their incredible artistic skills! Absolutely amazing, very well done! Another winner is Amolad, sharing their amazing artwork! Thank you for sharing your awesome work with us! Our last winner for this week is TheJolteon27, showing off a part of their Skyblock island and a lot of their Jolteon’s. A great achievement for them! Shiloh is ready to be explored! Shiloh region is filled with so much more than all of our previous generations, our new quest writing system has been used heavily here, and we hope you guys get to experience everything tenfold! Your journey begins with choosing your starter, a new Introduction has been made and tailored for new players to teach them what they need to know about the PokeFind network and some of its mechanics. After you have your starter, head on over to the Observatory, or speak to your Rival Danielle by the lab! In the Observatory is where your Main Storyline will begin! Locked PC - Your PC is now locked in Shiloh, you cannot use Pokemon from previous generations, because your new upgraded PC is too advanced until you obtain the necessary parts to upgrade your old PC from previous Gens. You will have access to your Pokemon in other Gens, just not in Shiloh. All Eggs opened in Gen 4, can only be used in Gen 4, for example: if you open a Aura Gen 1 Egg in Gen 4, you can only use it there, until your PC is unlocked. NPCs - You will see a new revamped way of NPC trainers! These are created through the questing system and are new and improved! Boats - Boats are now added into PokeFind! These are accessible through /boat & can be bought on the store at this time. We have just rolled out a a very exciting and highly requested update on Pokemon Survival! Before I get into that, 2x EXP Weekend is now live on Pokemon Survival and Pokemon World! This will last till Tuesday morning since we were a bit late with today’s update! - Added Trainer NPCs to Pokemon Survival. These will spawn around the world and despawn once their timer runs out. They will show up in your Pokemon Tracker when you are nearby a Trainer. - Added The Merchant to Pokemon Survival. These merchants spawn randomly around world just like Trainers. They sell different types of TMs for Tokens. Tokens can be earned by defeating Trainers or Gym leaders.